Currently under construction and on track to become operational early next decade, the Giant Magellan Telescope is pushing scientists to innovate and create new technology in their quest to see the faintest and most distant objects in the universe. 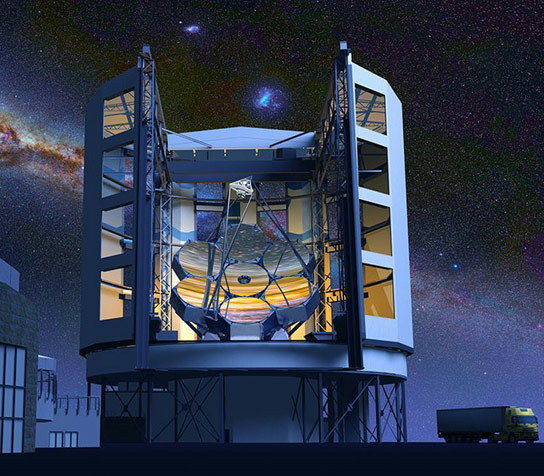 “The challenge for building this telescope is that we wanted to have a very big primary mirror,” says Charles Alcock, director of the Harvard-Smithsonian Center. “The reasons these mirrors need to be big is because we are looking for objects that are very faint.” Very big is an understatement; whereas the Hubble Space Telescope’s primary mirror is eight feet in diameter, the GMT’s will measure more than eighty feet. At ten times the diameter of the Hubble, it will also make images of things like distant planets transiting in front of stars ten times as sharp. When completed, the GMT’s enclosure will stand 22 stories tall and encompass an area the size of three football fields. Building those enormous mirrors is happening more than 7,000 miles from Chile, at the Steward Observatory Mirror Lab, located below the football stadium at the University of Arizona. Under the direction of astronomy professor J. Roger P. Angel, a team is spin casting the GMT’s lightweight honeycomb mirrors, named for their patterned appearance. Most telescopes contain two mirrors, but Angel and his team are using seven. The primary mirror will contain seven individual glass pieces, each weighing 20 tons. Six curved outer mirrors will surround the primary one, creating what Alcock from the Harvard-Smithsonian Center describes as “a unique shape in the history of precision mirror design.” The seven mirrors will come together as a mosaic and act as one large mirror with a single focus. The honeycomb mirror is the essential technology behind the super-telescopes that are taking scientists farther than ever before. The Large Binocular Telescope in Arizona, dedicated in 2004, uses honeycomb mirrors, as does the Multiple Mirror Telescope (MMT), also in Arizona. The MMT went into operation in the 1970s, and Angel fitted it with a new mirror in 1992. Scientists favor those mirrors because they tend to cool at night, unlike other types that remain hot and cause shimmering effects that spoil images. After six years of technological innovation, Angel’s lab completed the GMT’s first mirror in 2012. The team now has four mirrors at various stages of development, with as many as 30 people working on each one. “The biggest challenge [is] to make absolutely sure we have it right when it’s such a difficult shape,” Angel says. From Arizona, the completed mirrors will travel by highway—a factor that limited their size—to a boat headed for Chile. Angel is waiting for the completion and testing of the second mirror before starting the shipments. “The Giant Magellan Telescope is quite interesting because it’s probably, more than any other telescope we have ever built, really predicated on modern technology,” astrophysicist and 2011 Nobel Prize winner Brian Schmidt said at a Smithsonian event earlier this month. “It has lasers, it has this adaptable optics system. It has all this built together.” Schmidt is on the faculty at Australian National University, part of the GMT consortium. Schmidt and the other scientists have high hopes that putting the GMT into operation will be a success. Fortunately for them, unlike the Hubble Space Telescope, the GMT has the advantage of being Earth-based, should any problems arise down the line. With the GMT, scientists will have enough light to photograph distant planets and perhaps even learn about their atmospheres. If they discover signs of oxygen, then finding other life forms may not be far off. The enormous size of the telescope will also enable scientists to learn about dark matter and answer questions about when and how the first stars were formed. “The ability to go through and explore those first stars, that’s certainly one of things that I really want to do with the Giant Magellan Telescope,” Schmidt said at the event. The scientists invested in the GMT’s future all agree that it’s hard to predict the kinds of questions about the universe that their new technology might answer. “The most exciting discoveries are going to be unexpected,” Dupree says. 2 Comments on "The Creative Engineering Behind the Giant Magellan Telescope"
$1 Billion build for some more pretty space pictures? Then $3 million a month to maintain it?? What will they do when they finally have all the space shots they want? Perhaps publish the best ones in a special edition of Natl Geographic…right next to the article about the rate of Chilean poverty increase. Perhaps Mr Selby should read the articles neighbor making foolish comments.